The Imaging Power Panel is not a battery. It is a lightweight (compared to a battery) connector panel that connects, via a 6', 9' or 12' power cable, to your battery on the ground. Consequently, it can be mounted on a telescope tube, dovetail bar, mount, pier or wherever it is beneficial for you to allow for efficient cable management. 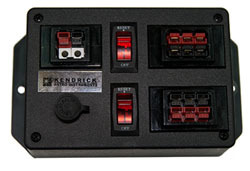 With this panel, you can connect, for example, your camera (CCD or DSLR), Kendrick dew control system, your mount and all your USB driven devices in one central location. If mounted on your telescope tube assembly for example, all your cables (except for the one going to your battery and the USB cable to your computer) are now routed from the devices on our telescope to the Imaging Power Panel. You then have only two cables coming away from your scope and mount, the power cable to your battery and the USB cable to your computer. All the other cables will now move with your telescope and not get tangled. New Option! What's better than cigarette lighter plugs? Anderson Power Poles! Anderson Power Poles are small, light, and can handle much higher current (30 Amp compared to 7 Amp max. cigarette lighter plugs. And best of all, they aren't going to be "cranky" and pop-out like those pesky cigarette lighter plugs. How do you make a Power Panel so small and lightweight? Ditch the Cigarette Lighter Plug! All new Kendrick Controllers and Power Panels can handle a lot of power, but a cigarette lighter plug can't handle more than 7 Amps. By using Anderson Power Poles, each plug can handle as much as 30 Amps. They have several added advantages: 1) Very small and light 2) They stay plugged-in! 3) They can be "stacked" into a "bank" of plugs which is a great way to speed-up set-up and tear-down of you gear. It's easy to convert your existing cords to the new Anderson plugs and we have great support staff who will help you learn how to do it! Anderson Connectors are clever "gender-less" connectors which allows you to mate plugs to make extension cords. We offer pre-welded (glued) pairs of plugs complete with 30 Amp contacts. Each pair can be "snap-locked" to other pairs to making a nifty wiring harness! We also sell the Anderson Plugs as "un-welded". This allows you to make "extension cords". NEW! >>Imaging Power Panels can be powered from a 12 vdc battery or with 110-240 VAC with the purchase of our #208-IPP-PS25A Power Supply. This special AC-DC Power Supply features 3 types of connectors: 1) Anderson 2) Banana Plug 3) Cigarette Lighter Plug. 25 Amps is enough power for just about any device you would ever consider connecting to a telescope. This is a very high-end power supply using low noise cooling fans. These are popular power supplies for medical diagnostic equipment and are very well suited for astronomy applications. Order 208-PS25A for 110/120 North American Plug OR 208-PS25A-UK for 220/240 UK "type G" Plug OR 208-PS25A-EU for 220/240 EU "type F" Plug. 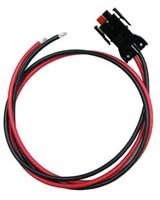 Suggested cable hook-up: 208-PS25A-CORD is a special 12' Cord that connects the 25 Amp Power Supply to any of our Imaging Power Panels, LINX Panels, or ePack. You will find this special cable listed below in the "Power Cables" section. #208-PS25A 240/120vac to 12 vdc, 25A power supply. Dew Heater Option - We are now offering a built in USB hub heater to keep the hub free from dew and frost. An additional benefit of these power panels is that you now have a top quality connector interface for your astrophotography rig that can connect and disconnect to a battery or power supply of your choice! 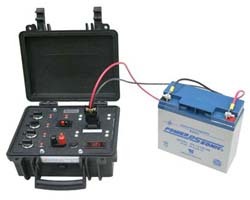 If one night you prefer to connect to a 10 amp 12 vdc battery, you can. If you want to take the Imaging Power Panel to a one week star party and connect it to a 100 amp battery, you can. There are no limitations. If your battery dies, you do not have to throw out Imaging Power Panel. You simply reconnect it to a new battery! 8 volt power supply for DSLR cameras or 12 volt supply for CCD cameras. DC battery adapter and 2 meter (6') cable for Canon and Nikon DSLRs. Owner must choose appropriate length cable for our list when purchasing. Active 7 port USB Hub. Hub is Full Speed V2.0 for #208-IPP-C & #208-IPP-D and V3.0 for #208-IPP-C-3.0 & #208-IPP-D-3.0. 6' USB-B to USB-A cable. 2 or 3 cigarette lighter sockets (depending on whether you have a DSLR or CCD camera). DSLR versions have one port converted to an 8 vdc power supply and that port becomes a DC barrel connector. If required, one port at 15 VDC (for Astro Physics GoTo Mounts), 18 VDC (for Losmandy Gemini mounts), 24 volts (for Takahashi GoTo mounts) or 48 volts (for Paramounts). The Imaging Power Panels come in several configurations and may also be customized, with certain limitations, to your needs. We can use other connectors so if you prefer the use of a connector other than the standard cigarette lighter sockets, let us know. If we can accommodate you, we will. If you are interested in a custom panel, you will need to contact us to discuss your needs. 208-IPP-D-3.0 which has a built in 7 port active USB 3.0 Hub, an 8 vdc DSLR power Supply and 4 cigarete lighter sockets. 208-IPP-C-3.0 which has a built in 7 port active USB 3.0 Hub and 4 cigarette lighter sockets. 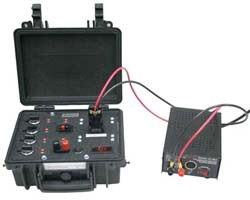 You can specify the following features: one output with 15, 18, 24 or 48 volt inverter. One of the 12 volt cigarette lighter sockets will be converted to this voltage and will have an XLR connector instead of a cigarette lighter socket. 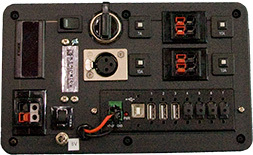 208-IPP-D-3.0 imaging power panel with optional 15 volt inverter package. Also shown are the optional USB Port Dust Covers. Cigarette lighter sockets for 12 volt outputs. 8 volt DSLR power outlet is a threaded 5.5mm x 2.5 locking barrel DC Power connector. USB hub amperage: 3.5 amps total, .49 amp per port. 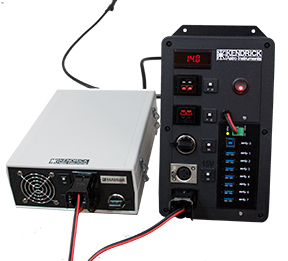 The #208-IPP-D-3.0 and 208-IPP-DAC-3.0 has an 8 vdc power supply built in. If ordered, a 15 volt or 18 volt inverter will built into your unit. It puts out smooth 15 or 18 volts and is unaffected by voltage cycling due to varying power demands. Circuit breakers on all outputs (1 x 10 amp, 1 x 7 amp, 2 x 5 amp) DSLR version has an extra 2 amp circuit breaker). No need to carry spare fuses. USB hub has its own internal fusing and is not on a circuit breaker. All ports (including USB hub) have ON/OFF switch with LED power on indication. Platic dust covers for all USB ports except USB-B. Plastic insert caps on Cigarette Lighter sockets to keep dirt out when not in use. Plastic tabs on the case at each end to aid mounting to a surface of your choice. 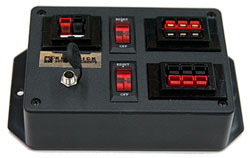 Power hook-up cables are purchased separately and are required to connect the Imaging Power Panel to a power source. We offer three lengths of power hook-up cables, 6', 9' and 12'. Choose your cable termination from alligator clips, ring terminals, spade terminals or bare wire. Purchasing, what do I need? Determine which version of the Imaging Power Panel you will need. DSLR or CCD?. Determine length of Power supply cable you will need. This is the power cable from your power source to the Imaging Power Panel. See "Power Cables (To Battery or Power Supply)" below. Do you need the 15, 18, 24 or 48 volt inverter? See "Inverter Upgrade" below. For Canon and Nikon DSLR owners, Choose appropriate DC power battery adapter. See the camera chart below to determine which DC adapter to choose and the see "DSLR Camera Battery Adapters" below that. NOTE: Our DSLR Camera Battery Adapters are common to all Controller Models that have the DSLR Power Supply. For Micro-D Controllers, the "barrel plug" is longer than needed (the threaded locking ring won't engage), but it works just the same and offers the benefit of using the adapter on any of our controllers with a DSLR Power Supply. DigiFire 8 & 12 have a slightly different DC output connector so please chose the “DigiFire 8 & 12 ONLY” version. The ePack product was the predicessor to our newer Imaging Power Panels which became much more popular than the orginal ePack. The new Imaging Power Panels do everything that the ePack did but also added a built-in USB powered hub. SInce launching the Imaging Power Panels we were making so few of the ePacks that we decided to discontinue the product. Power Cables are still available for current ePack owners. 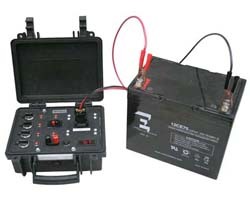 ePack with built in 18 volt inverter. 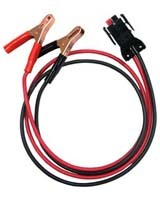 Power hook-up cables are purchased separately and are required to connect the ePack to a power source. 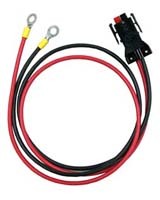 All the ePack power hook-up cables come with a snap-on Anderson Powerpole Pak connector that attaches to the ePack power input connector. The cables are colour coded: black for negative and red for positive. The cables have been designed to make reverse polarity hookup impossible. All cables are about 3' (1 meter) long. An optional shoulder strap is available and is an excellent addition for comfortable, hands free transportation. We have the capability (limited) to populate the ePacks with connectors of your choice. Contact Kendrick for price and details. Custom hook-up cables are available upon request. We can make the cables the length you prefer and can provide some limited custom connectors. Contact Kendrick for details and price.